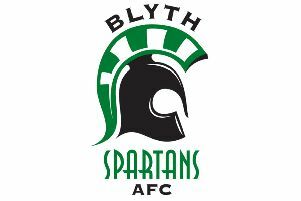 An enthralling game saw fourth place Buxton take a two-goal lead over the league leaders before Blyth Spartans mounted a spirited come -back to claim a worthy draw. After chances at both ends, Bucks took the lead after 18 minutes when a neat one-two put Liam Hardy through on goal and he wasted no time in firing low past Woolston’s right hand. Blyth could have equalised within minutes but a pass from Armstrong appeared to hit the standing foot of Sean Reid, who was attempting to shoot from six yards out, and the ball was cleared. The home side were causing problems for the Blyth defence with their pacey passing and clever movement. Their possession paid off after 25 minutes when they extended their lead. Watson was adjudged to have fouled Joe McGee 20 yards out. Full back Jamie Green took the free kick which sailed over keeper Woolston and the head of Reid and nestled in the top corner of the Blyth net. Spartans responded and Reid headed narrowly past the post before another dynamic Wrightson run saw him cut in from the right but his left foot attempt was wide. A Robbie Dale free kick was well held by Budtz before Blyth got what they deserved for their efforts when a Dale free kick fell to Maguire who smartly stabbed the ball home from three yards to make it 2-1 at the break. Blyth resumed in more determined fashion after half-time. Following another Dale free kick a Reid shot rebounded to Maguire but the rangy Budtz was quick to smother his shot. Reid was then able to round the Buxton keeper but Danny Burns was well positioned to clear his effort. On 60 minutes a lovely through ball by Jordan Laidler found Maguire whose first touch was exquisite but his shot was cleared as Blyth began to find an extra gear. A Reid snap-shot was tipped over the bar by Budtz before a first-time volley by Maguire was well held by the diving keeper. However, Maguire was not going to be denied for long and on 65 minutes he equalised for Spartans, poking the ball home following precise interplay with Armstrong. Buxton responded positively and created four half chances within as many minutes. First they claimed Reid had handled the ball in the penalty area following a shot by Brad Abbott, but the referee waved away their protestations. Brad Grayson then shot wide twice before he forced Woolston into an excellent save. As the game ebbed and flowed it was Blyth who went on to take the initiative. A low Andrew Cartwright cross was met by the on-rushing Armstrong and his shot skimmed only just wide of the post. Then David McTiernan nearly got his head on a Dale cross before Maguire smashed in a shot which eluded the target. The game finished 2-2 with both sides probably thinking a draw was a fair result. Blyth take on Skelmersdale at Croft Park on Saturday with a 3pm kick-off.